We’re sitting outside at a quiet cafe in Shepherdstown, West Virginia—the college town Hudkins has called home for the better part of 13 years. Although our conversation is winding down at this point, you’d be hard-pressed to find a story that better captures the essence of Rozwell Kid. Hudkins’ supercharged band also stirs up these ingredients that shouldn’t necessarily work well together—monstrous riffs, dueling guitar solos, and rampant pop culture references—while disguising real vulnerability underneath song names that could belong on a stand-up comedy album. 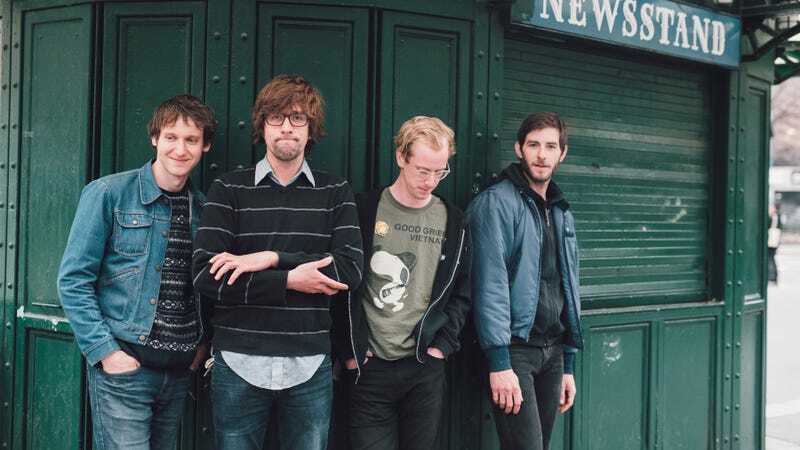 Rozwell Kid is one of the few bands that can claim Blue Album-era Weezer, Thin Lizzy, and Weird Al Yankovic all as legitimate influences, but Hudkins doesn’t want to get that confused with being a parody act. On the band’s latest record, Precious Art, you’ll find a song about wanting to retreat home, eat tacos, and watch Weird Al’s 1989 cult classic UHF on DVD instead of succumbing to anxiety in a restaurant. That particular track is sandwiched between a 57-second ode to finding a parking spot at South by Southwest and a song called “Booger,” which is as literal as it sounds—but it’s also a genuinely tender power ballad about coping with heartbreak and memory. An hour ago, we were engulfed in a highly competitive bowling game at Pikeside Bowl (we finished with one strike each and about ten more gutter balls). The place has some character in its clashing elements. At one point, the “Cold Beer on a Friday Night” song blares while a muted TV is airing Jeff Sessions’ Senate testimony. A kid-friendly purple dinosaur ride sits right next to the snack bar, which is the only place where you can get water because too many people threw up in the old drinking fountain. And there’s this graphic of bowling balls and pins at the end of each lane that swirls around like the Mr. Krabs meme. “I’d forgotten how much of a Big Lebowskivibe this place has. It’s pretty retro, but not in like the cool, on-purpose way,” Hudkins cracks. Between frames, we touch on everything from what keeps him in the area (“I’m comfortable in my situation here”) to our favorite superheroes (his: Superman, Batman, Wolverine, Spawn). Hudkins sports a red plaid button-up with a t-shirt underneath and jeans; his long brown hair threatens to overtake his glasses and cover his ears. He reminds you of the affably nerdy kid in high school who managed to be friends with everyone, while still making wisecracks from the back of the classroom. Hudkins grew up roughly an hour south of the bowling alley in a tiny midstate town “sandwiched between two coal mines.” He spent most of his time in the marching band, drawing comic book characters, and acting in school plays, with dreams of becoming an actor. By playing with Rozwell Kid, he gets to juggle all three interests. “I fulfill both desires: my extreme desire to be the center of attention and getting to play music, write music, travel. I like being in a band, it’s dope,” he says. “I want to put that on a t-shirt,” he says, letting out a heavy, earnest belly laugh. This mindset translates to their live show, which is the most fun I’ve had at a concert this year. Hudkins can often end up on the floor, shredding through a solo. Expect purposeful leg kicks and hand-to-the-sky strums from guitarist Adam Meisterhans. And during their tour with PUP last year, the band had a well-documented ritual of holding the set’s penultimate note for as long as humanly possible. (It once exceeded three minutes.) On this current tour for Precious Art, it seems like they’re attempting a similar trick with the minute-long track “Wish Man,” in which the band turns into barking dogs. Someone asked them for a longer version on Twitter, which of course willed an eight-minute rendition into existence. And there it is, the reason why Rozwell Kid is so special: It’s not their antics, but the fact that Hudkins and the band often seem to be doing this just for themselves. He mostly sings from such a personal perspective, recalling cultural touchstones that mattered to him, like Michael Keaton flicks, Mad TV, Sheetz receipts, and the people who were around to experience it all. There’s a hyper-specificity to his songs at times—but even if you didn’t grow up with those references, the feeling’s universal. It’s a nostalgic fondness for whatever helped you through the messy ride of growing up that remains a constant. Consider the leg kicks and boogers a bonus.